Each Bottle Contains:60 capsules per bottle. Disclaimer: Our product is a certified natural health product of Canada. It is used in traditional Chinese medicine used to reinforce kidney Yang, replenish vital essence and blood, and strengthen the tendons and bones. 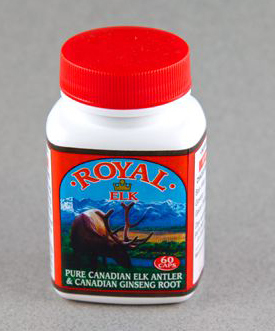 People with high fever, cold and rapid pulse (blood pressure) should consult a healthcare practitioner before consuming elk velvet antler. Do not use if pregnant or breastfeeding. If symptoms persist or worsen, or if new symptoms develop, consult a health care practitioner. If you are taking prescription medications, consult a health care practitioner prior to use. Do not use if you have heat from yin deficiency, heat in the blood level, phlegm-heat in the Lungs, blazing Stomach fire or warm-febrile disease.